How trends in the U.S. Agriculture industry can affect farm related real estate. Similar to periods before deleveraging and bust periods in agricultural environments, today’s low interest rates and high farm land values are encouraging farmers to incur significant amounts of debt while national net farm income continues to decrease, and U.S. interest rates continue to rise 1. It is important to ask whether today’s high farm values are sustainable and what the implications are of increasing debt on farm property as farm revenue declines. Over forty percent of the U.S. is considered farmland. Historically, the nature of U.S. agriculture is cyclical with significant increases in profits and investments found as common features at the end of each boom 2. The trends of today could be conducive to a downturn in the farming industry, and can potentially affect farming REITS and industrial real estate that is tied to agriculture. In prior agrarian deleveraging and bust cycles, farmers’ investment in farming assets remained high, even when profits declined during periods of low interest rates. Most farm assets are concentrated in farm real estate and add to farm value and, in these times, farmers tended to use their farm equity as collateral to finance investments instead of using their retained earnings. The mixture of falling profits and rising interest rates drove farm values lower and triggered deleveraging cycles in U.S. agriculture. The investment behavior of farmers exacerbated the severity of the cycles. These situations culminated in the farming busts of the 1920s and 1980s when many farmers faced bankruptcy as farm profits plummeted, interest rates increased, and farm land values subsequently declined. The factors that lead to these busts are not exclusive to the time periods, but are conditions that encourage risky behavior 3. In the 1920s, falling farm revenues and higher interest rates drove farm values down 25 percent, which were exacerbated during the following Great Depression. Farm values in the 1980s fell 40 percent under similar circumstances. In both of these situations, farmers’ leverage ratios were too high which ultimately led to bust cycles. Farm bankruptcies in the 1920s and 1980s spiked when farmers’ debt to asset ratios rose above 20 percent as farmland values plummeted, eventually forcing bankers to write down debts. 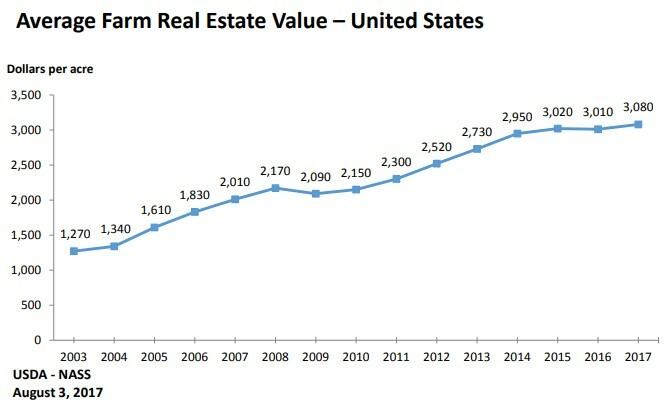 As farms were forced into sale, farm land values decreased even more. Today, farmland value in the United States is at a record high. Depressed interest rates have encouraged investments that worked to increase farming productivity, thereby increasing the value of farmsteads. Farmland value is averaging $3,080 per acre and is up 2.6 percent from the previous year. Net farm income, however, a comprehensive measure of profits, adjusted for inflation, is forecast to decrease 8.3 percent in 2018, the lowest net farm income level since 2002. Though the cattle and calf farm business is expected to increase by 6.2 percent in 2018, the largest detractors bringing down overall national net farm income are the crop farm businesses, hog, poultry, and dairy farm businesses, as well as the wheat and dairy farms which are expected to see over 10 percent declines. These decreasing forecasts in the different farming sectors, however, will likely be addressed in the form of price supports in upcoming farm policy legislation. The speed of interest rates, set by U.S. fiscal policy, will also have an impact on the future of the farming business, and consequently the performance of REITS and industrial facilities in proximity to farmland. Low interest rates of the past decade have encouraged a wave of capital investment throughout the U.S. farm sector and pushed up farmstead debt levels. Farm debt is forecast to increase by 1.0 percent culminating in an expected 1.2 percent rise in real estate debt, totaling $388.9 billion. Despite the forecasted declines in farm revenue, farm sector equity and farm assets are forecast to increase each by 1.6 percent, reflecting a 2.1 percent rise in farm sector real estate value. As seen in prior deleveraging and bust cycles, low interest rate environments and increases in farm land value encourage the accumulation of debt for investment capital, over using available capital, even if prices start to decline. 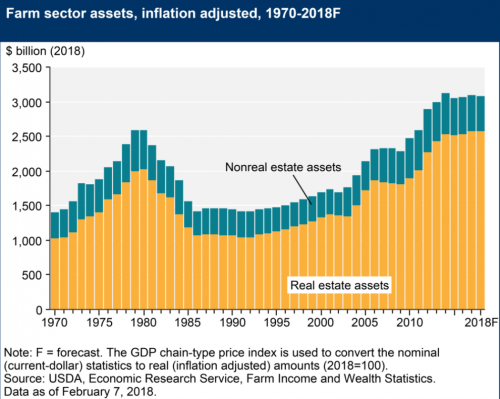 Though today’s setting is similar to periods prior to deleveraging and bust cycles, several factors can affect the course of the farming industry and farm related real estate and investments in the next few years. For instance, U.S. banking and agricultural policy has huge influence on the U.S. agriculture business. The speed at which interest rates rise under guidance of the Federal Government will impact the leverage ratios of farmers. Additionally, threats of a trade war between the U.S. and China, as well as the renegotiation of the U.S. entry into the Trans Pacific Partnership will also have an effect on the profitability of farmers. Most importantly, the Agriculture and Nutrition Act of 2018, introduced on April 12th, commonly known as the five year Farm Bill, will have an affect on U.S. policy on farm subsidies, expansion of credit, crop insurance, rural development, regulation, and the farm workforce. The bill has huge payoffs for the farm industry being a large constituency of the leadership in Washington D.C. The impact of U.S. policy on everything from interest rates and trade to subsidies and workforce development will have huge implications on farm land values and will be something to watch closely in 2018.